Saudi Arabian women's rights activist Loujain Alhathloul appeared in court with several other women for the first time since her arrest and detention in May 2018. 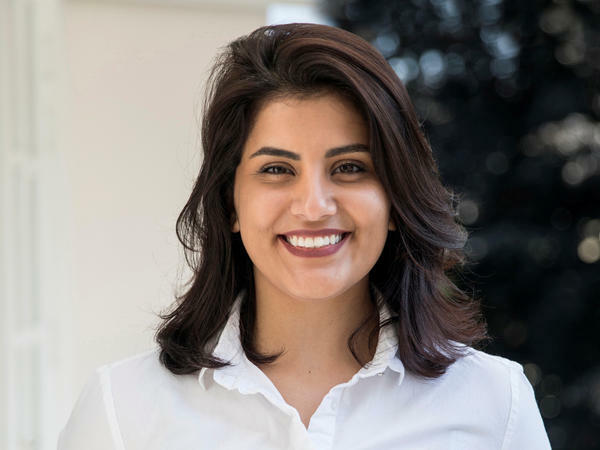 Saudi Arabian women's rights activist Loujain Alhathloul was among several women to appear in a closed-door hearing Wednesday in a case that has added to heightened global scrutiny over the kingdom's human rights record. This is the first time Alhathloul appeared in court since she was picked up in a sweep of arrests in Saudi Arabia last May that targeted rights activists, journalists and academics. Reporters and diplomats were barred from attending the session. "[The women's rights activists] haven't been given access to a lawyer and now today they have been charged," Samah Hadid, the Middle East director of campaigns at Amnesty International, told NPR. Amnesty is working to verify the charges against Alhathloul, which include contacting foreign entities and international organizations. The government has not publicly shared the charges against the activists. A spokesperson for the Embassy of Saudi Arabia did not immediately respond to NPR's request for comments. Alhathloul's brother, Walid, tweeted late on Tuesday that her case had been moved from the Specialized Criminal Court, which hears terrorism cases, to the criminal court in Riyadh. 🔴UPDATE: The State Security contacted and informed us about the latest update (8 hours before the trial). @LoujainHathloul’s first appearance in the Specialized Court (terrorism court) will be changed to the Criminal Court in Riyadh. Walid Alhathloul told NPR's Mary Louise Kelly that his sister has been subject to torture, such as "electrocutions, waterboarding. Also, she was subject to sexual harassment," he said. "That was from the top adviser of the Crown Prince Mohammed bin Salman, whose name is Saud al-Qahtani. And he was actually overseeing the torture," Walid Alhathloul told NPR. Alhathloul's other sister, Alia Alhathloul, made similar allegations in a New York Times op-ed in January. In a visit to Washington, D.C., last month, Saudi Minister of State for Foreign Affairs Adel Al-Jubeir told reporters that the women were a threat to national security. "There were funds received from foreign governments that were hostile," he said. "There were ... attempts to recruit individuals in sensitive positions and to take sensitive information and pass it on to hostile entities outside Saudi Arabia. So there's more to it than meets the eye." The Saudi government has not shared evidence of those allegations. Loujain Alhathloul gained prominence when she took a video of herself driving from the United Arab Emirates to Saudi Arabia in 2014, where women were banned from driving at the time. She was arrested then and released more than two months later, but was arrested again last May, just weeks before the ban on women driving was lifted, and has remained in jail since. Alhathloul's friend and activist Urooba Jamal told NPR, "I think that Saudi Arabia has felt threatened by the activists and their positions, and I think they're trying to teach them a lesson." Saudi Arabia's human rights record has been the subject of global criticism, and was rebuked by the U.N. Human Rights Council last week for the first time since the panel was established in 2006. The council's 36 member states signed on to the statement condemning the kingdom's rights record, specifically naming Alhathloul as well as activists Eman al-Nafjan and Aziza al-Yousef, who also reportedly appeared in court today. U.N. Human Rights Commissioner Michelle Bachelet called on Saudi Arabia to release the activists last Wednesday. (SOUNDBITE OF JULIA KENT'S "LAST HOUR STORY") Transcript provided by NPR, Copyright NPR.